Bike Adventure wrapping up record year, but still needs your support! As hard as it is to believe, the 2016 Fuller Center Bike Adventure year is drawing to an end after the conclusion of the Silver Comet ride this past weekend. The 128-mile weekend event drew 26 riders from 10 different states, coming from as far away as California and Michigan. Riders were treated to beautiful wilderness views along the Silver Comet Trail and at the Chief Ladiga campground in Alabama. Between the participants, we were able to raise over $1,900 for the affordable housing movement! As a whole, the 2016 Bike Adventure year was full of new surprises. Our annual Spring Ride featured an additional build day with the Fuller Center for Housing of Middle Tennessee, as well as the traditional build day with the Greenwood/Leflore Fuller Center for Housing in Mississippi. 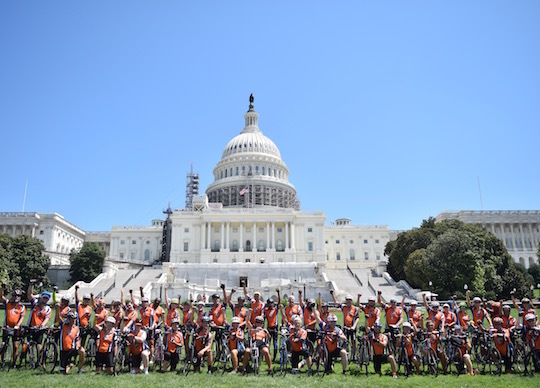 The Summer Ride experienced incredible growth this year- with increasing participation causing us to split the ride into two groups for the first time ever! The 2016 Bike Adventure fundraising goal was $200,000 dollars. Thanks to riders, friends, and family all over the nation, we have shattered that number and are sitting at $299,388.74, placing us dangerously close to raising a full $100,000 over our original goal! The last day to donate and have your dollars count towards the 2016 year is this Friday. If you would like to help us make even more Bike Adventure history, follow the link below to donate! Thank you to every participant, support team member, church host, Covenant Partner, donor, and friend made along the way for helping make the 2016 Bike Adventure year the huge success that it was. Oyee!